If you've ever tried driving through a foggy windshield, you know the vision quality is far from ideal (or safe!). For many contact lens wearers, lens fogging is a daily struggle. Typically this fog is created by debris from the surface of your own eyes - tear film lipids, proteins, and mucins sticking and smearing on the surface of the contact lens and creating an oily coating. Blinking just spreads the film around, and typically only removing the lenses and cleaning the surface will improve your vision. In soft contact lens wearers, the solution to fogging issues is most often changing to daily disposable contact lens materials which maintain clarity due to a fresh, clean surface every day and being made from thinner and more debris repellent materials. For hard or rigid gas permeable lens wearers, hybrid contact lens wearers, or scleral contact lens wearers, no such solution exists. Luckily there are several options for improving clarity and busting fog with these lens options too! 1. Call the lens manufacturer to report the issue. During the manufacturing process, rigid gas permeable contact lenses are cut on a lathe. For scleral contact lenses especially, this lathing process can expose the lens to excessive heat. Higher temperatures during manufacturing can prevent the lens from being able to properly wet on the eye. The lens manufacturer will make a note when remaking the lens to reduce lathing time in this case. 2. Ask for Plasma Treatment and Wet Shipment. 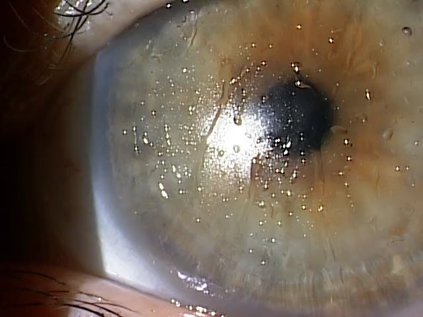 Plasma treatment is not a coating, but rather a hyper-cleaning technique that removes microscopic debris on the surface of the contact lens after the manufacturing process. Rigid gas permeable (RGP) contact lens plasma treatment involves the blasting of ionized oxygen particles against the surface of the lens in a vacuum chamber. The oxygen interacts with organic debris on the surface of the contact lens, especially effective against organic lipids and oils. Right after plasma treatment the lens is as clean as it will ever be! It is immediately placed in a liquid storage solution (most labs use Boston Simplus) because if the lens is stored dry at this stage, the surface will immediately start collecting debris again. Studies show plasma treatment improves lens wettability and initial patient comfort, and reduces the risk of lens fogging. If you have plasma treated contact lenses, the best way to maintain this level of surface clarity at home is to use the right RGP lens cleaner. Boston Simplus, Optimum pH, and peroxide based cleaners like CLEAR CARE are all compatible. Do not use abrasive lens surface cleaners like Boston Advance. Silicone-based materials are very popular in today's contact lens marketplace due to their better breathability, but silicone can make contact lenses more hydrophobic - meaning they collect more debris. Changing to a lens material without silicone or with lower amounts of silicone can help reduce surface build-up issues. For healthy eyes without any evidence of prior scar tissue or oxygen loss (hypoxia) traditional, Fluoroperm is an incredibly debris repellent material! Fluoroperm 30 is considered an old-school work horse for heave depositing patients, but watch carefully for oxygen issues to the cornea like neovascularization or pannus. For patients in such low oxygen permeable lenses, changing lenses regularly is important to maintaining corneal health. For most RGP wearers, recommended disposal is 1-2 years to prevent infection or corneal scarring or warpage. For scleral contact lenses that cover more of the eye, Fluoroperm does not offer enough oxygen transmission to be safe. In this case, Tyro 97 is an excellent option for debris repellent lens material that still provides enough breathability to be safely used in a scleral contact lens fit. Tangible Hydra-PEG (Tangible Science) is an exciting new coating available across multiple lens materials. Synergeyes hybrid lens materials and RGP Optimum lens materials are compatible currently, and by the end of 2018 it's expected that Boston materials will be available too. The PEG in Hydra-PEG stands for polyethylene glycol, a lubricant that's been used in artificial tears for decades. The Hydra-PEG coating is permanently bonded to the surface of the contact lens material, encapsulating the core lens material to improve wettability and help prevent surface lens debris. Multiple studies have shown that the addition of Tangible Hydra-PEG to the lens surface improves both wettability of the lens and lubricity (reduced friction across the surface of the contact lens as you blink). 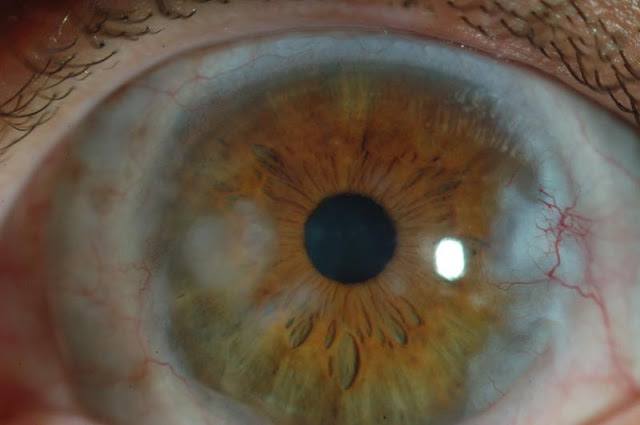 On-eye studies performed at the University of Iowa also had compelling results. 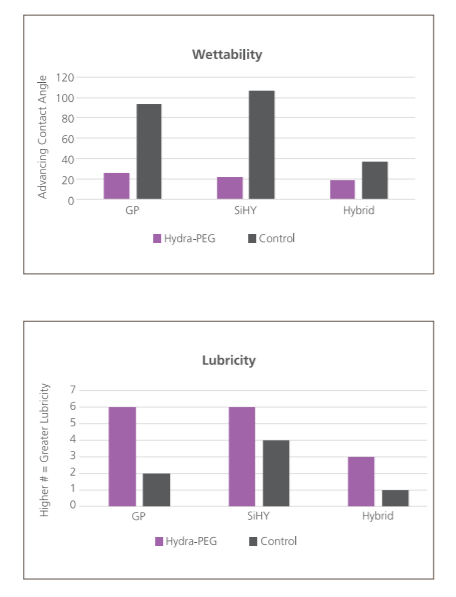 Existing RGP contact lens wearing patients were refit into lenses with Hydra-PEG coating. There was no change in visual acuity, but the patients classified before the study as moderate or heavy depositors in their habitual lenses reported clearer vision, better overall comfort, and less haze in their new Hyrda-PEG coated lenses. The addition of Tangible Hydra-PEG can cause changes to the handling of the contact lens as well. Because of the increased lubricity (decreased friction) on the lens' surface, the contact lens becomes more "slippery" after the addition of Tangible Hydra-PEG. For gas permeable lens wearers, this is not typically an issue because the lenses are removed most often with plungers. But for soft or hybrid contact lens wearers, it might be more difficult to grip the lens between your fingers to remove. If you are having difficulty removing your Synergeyes hybrid contact lenses with Tangible Hydra-PEG coating, the company recommends using a tissue over your fingers to help get a better grip. Approved lens cleaners for use with Hydra-PEG include Boston Simplus, Unique pH, and CLEAR CARE cleaning and disinfection solution. Do not use alcohol based cleaners as they could damage and strip the coating with time. Alcohol based cleaners like MiraFlow are commonly recommended for patients with heavy depositing issues, but if you switch to a Tangible Hydra-PEG coated contact lens, this solution should be discontinued. 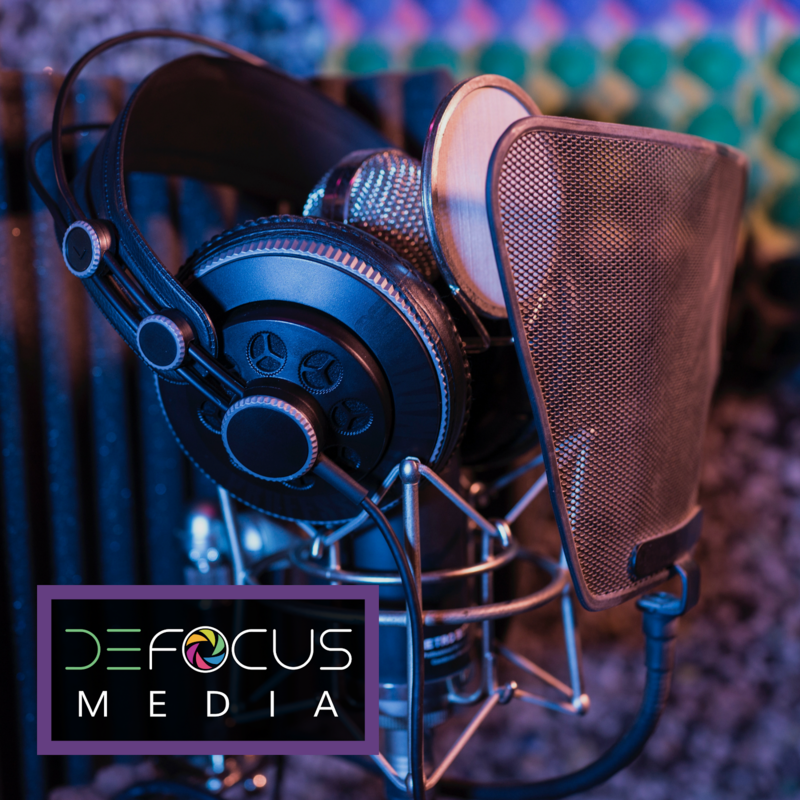 The most common reasons for fogging, debris, and lens wetting issues are because your own tear film's lipids and proteins are smearing up and collecting on the surface of the lens. Many doctors approach fogging as a two-prong attack: changing the lens surface to make it more resistant, and changing your tear film to make it more balanced. 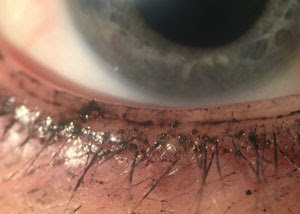 Patients with dry eye and meibomian gland dysfunction (MGD) are at increased risk of lens fogging because their tear film components of mucin and lipids are out of balance. 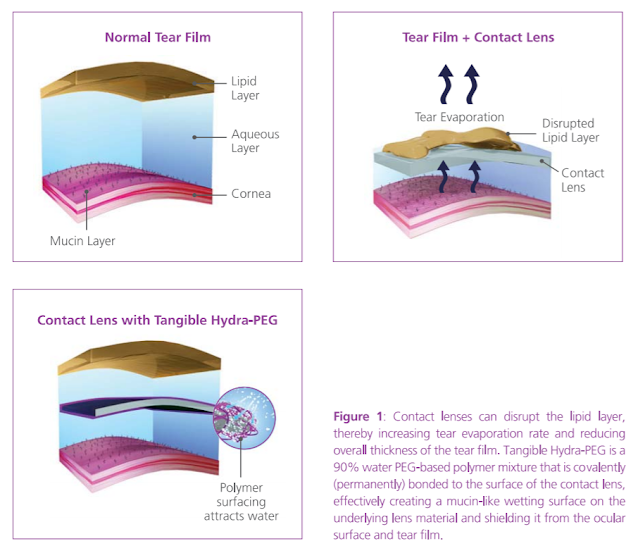 Restoring the tear film to homeostasis can help decrease the amount of protein, lipid, and debris floating around in your tear film and thus decrease the risk of it causing fogging and debris on the lens surface. Meibomian gland dysfunction is extremely prevalent! Over 80% of the estimated 20-30 million Americans with dry eye syndrome have meibomian gland disease. The meibomian glands express the lipid or oily layer of the tear film. To minimize lens surface issues in patients with MGD, doctors will often advise using a nightly warm massage or Bruder mask to improve gland expression, and cleaning the eyelid margins thoroughly each morning before inserting lenses. Avenova eyelid cleansing spray or OCuSOFT lid wipes are commonly prescribed options for daily lid hygiene. The products you use around the eyes and face could also contribute to lens fogging! Before inserting your lenses, make sure you thoroughly wash off any lotions or creams from your hands and finger tips and dry your hands completely on a clean cloth. Makeup and lotions are heavy on oils, which can immediately fog your contact lens if they come in contact. Insert your lenses before applying any makeup or skin cream to avoid exposure of these oils to the lens surface. And when you do apply eye makeup, make sure you avoid the waterline area! This is where the delicate meibomian gland openings are located, and any makeup products applied here will be smeared across the surface of your eye and contact lens all day long. If you've been frustrated by foggy, cloudy contact lenses, there is plenty of hope in sight! Tangible Hydra-PEG coating is continuing to expand to multiple lens materials, and we may even see it commercially applied to standard soft contact lenses in the near future. Fighting off fog is a constant battle for patients with underlying risk factors like chronic dry eye, so working closely with your doctor to explore all causes and solutions for your particular underlying issues is essential to maintaining clear vision. The addition of coatings like Tangible Hydra-PEG is truly just the beginning! A recent Review of Optometry article previewed a future where contact lenses are coated with anti-microbial films to reduce the risk of contact lens related infections, of where contact lenses were treated with surface coatings that allow for electro-conduction, turning your contact lens into wearable lens technology that could monitor your health status directly from the surface of your eye.